The National Democratic Congress (NDC) Member of Parliament (MP) for Kumbungu in the Northern Region, Ras Mubarak, stole the headlines in Parliament yesterday when he parked his luxurious Toyota V8 official vehicle at home and rode bicycle to work to protest against the high cost fuel in the country. Ras Mubarak, who lives at Adjiringano, near East Legon in Accra, covered about 17 kilometres. He blamed the government for the high cost of fuel and asked it to reduce the prices of petroleum products to reduce the cost of all items in the country. The Kumbungu MP appealed to all like-minded people to join him in the protest to force the government reduce fuel prices in the country as promised by the President during the 2016 campaign. He said he would continue ride to parliament at least once every week to continue to prompt the government to fulfill its promise to reduce prices of petroleum products. He said during the journey to Parliament House, he also realised the dangers pedestrians and cyclists face daily when using the road. 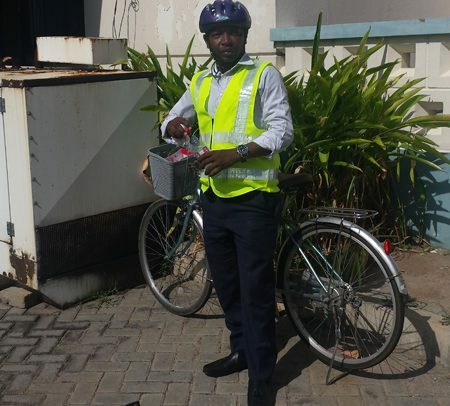 Ras Mubarak said he would start championing the cause of other road users and make a statement on the floor about the need to promote education to ensure the safety of road users, especially cyclists, pedestrians and motor riders.